The front of the new Church of Scientology building at 16th & P Streets NW around noon today. 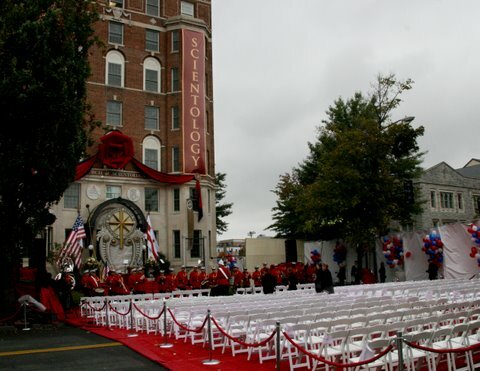 The Church of Scientology dedicated its new facility at the northwest corner of 16th & P NW today, which is why 16th Street near P was blocked off. Dcist has more on the event. What are you doing tonight? 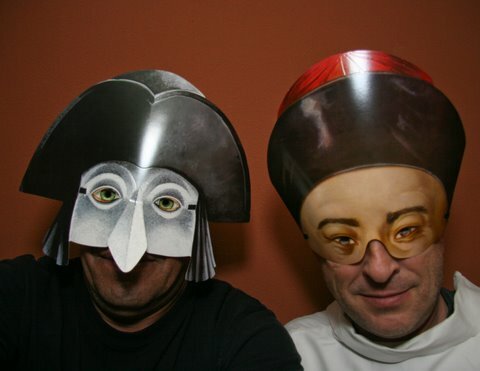 Luis and I got these great “traditional Victorian” style paper-cardboard masks at Pulp (14th & S Streets NW) for only $4.50 each. Luis is the “Venetian” and I am the “Mandarin.” We got the last ones in these styles and there was only one other style for men, “El Capitano.” However, they had a number of masks left for women as of Thursday evening. From the 14th & U Farmers’ Market… this is TOMORROW at noon. There is also a bake sale with proceeds benefiting Martha’s Table. The rain is gone (for now) and DDoT was finally able to get started on the southbound bike lane on the west side of 15th Street NW. 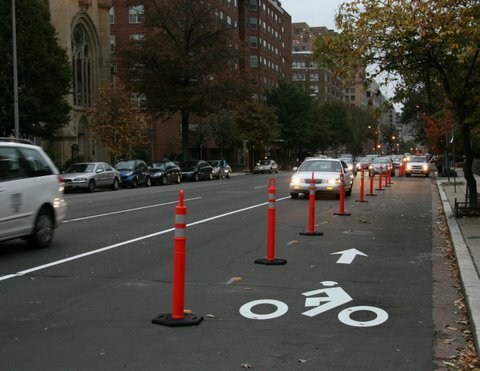 Yes, bikers will ride southbound on a one-way northbound street, between the curbed and parked cars–from Massachusetts Avenue to Florida Avenue NW. 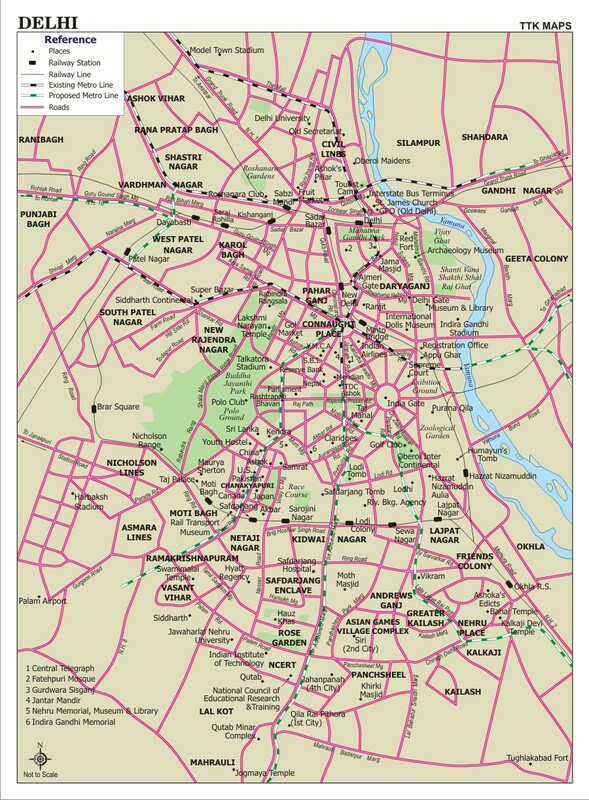 Editor’s note: “Popeye” is a new contributor to Borderstan and is posting “Delhi Dispatches,” periodic reports on life in Delhi, India. He and his wife, “Olive Oyl,” are former Borderstanians, neighbors and friends of ours. They moved to India almost two years ago (Olive Oyl is originally from India) and are the proud new parents of a baby girl, “Swee’Pea.” No, these are not their real names, but there are lots of strange people out there and Popeye asked that we use pseudonyms. Trying to put the following into words will be difficult, but here goes. The other night I went over to a friend’s house for dinner. Before starting to cook, we decided to go and check out this night festival, followed by dinner at another friend’s place… very close to where this festival was taking place. As luck would have it, these simple plans held far more in store for us. The festival was the phool walon ki sair–procession of the florists– and it was unlike any festival I had ever been to. No big surprise there. What was surprising was how eerily similar it was to something you might see in a strange B-grade horror film: sort of like a carnival set in a rural American town back in the early 20th century–or what I would imagine what one would look like anyway. What Will You Do Halloween Night? Update: Here is the story (and a real pic) from Phyllis D. Klein; she took the photo and has the story on Community Matters DC. Hope the deer is okay. 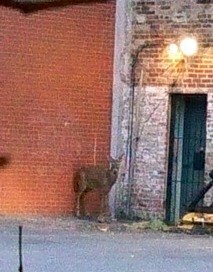 A deer was spotted this morning, standing in the rear of 1912 14th Street NW, which is just south of U Street. There was a message on the Dupont Forum and U Street listservs on Yahoo! Groups, with a photo. (I saw the photo, but don’t have permission to post it.) My guess, from the pic, is that it is a White-tailed doe. Apparently Animal Control rescued the deer. Anyone know anything more about the deer? Birch & Barley and ChurchKey at 1337 14th Street NW are two new additions to the 14th Street corridor of restaurants and bars. Birch & Barley offers what sounds like as a delicious menu in the high-priced range. Both of these places offer an extensive list of beers. We are still waiting to go. Let us know what you think. Masa 14 is at 1825 14th Street NW and is another new addition to the neighborhood, offering Latin-Asian inspired cuisine in small plate offerings. Ever since its soft opening last week the place has been full every night (I walk by regularly). It is beautiful inside and I was able to photograph it last Sunday. Reservations are recommended. Again, we are still waiting to go; let us know what you think if you have already been. Teaism at 2009 R Street NW is a favorite around the neighborhood with a nice selection of teas and wonderful food. Perfect for a weekend brunch with a great and fast service–I had a very good meal last Sunday. Is it the event of the year on the Dupont Circle side of Borderstan? At his blog, One Photograph A Day… Luis got some great pics of the revelers in their Halloween costumes at tonight’s 17th Street High Heel Race and created a slide show. He also provides some background on the history of the race. The annual 17th Street High Heel Race is all about the participants, the costumes, the characters. The race, while amusing, is a sideshow. The real fun is in meeting the people who show up every year in costume to one of Dupont Circle’s biggest events. Following is an interview, “A Quick Chat with ‘Anna Wintour,’ ” that profiles one of the Washingtonians who has made the annual Race a big Halloween event, drawing thousands of spectators. I have known “Anna Wintour,” who I shall identify as “Madame X“–but well known in his real identify to friends and fans–for 10-plus years. Each year I await his Halloween costume to see what persona he will take. This year Madame X is attending tonight’s High Heel Race as Anna Wintour, the longtime editor-in-chief of Vogue magazine–and subject of many articles herself and even a movie or two. Get Borderstan.com updates and news on Twitter. Find us at www.twitter.com/borderstan. Here are recent crimes of note in Police Service Areas (PSAs) 208, 307 and 305 for the October 17-23 period in the Dupont Circle, U Street and Logan Circle areas. Crimes of note are stolen autos, burglaries and violent crimes such as robberies and assaults. Rain or shine. Today is the annual 17th Street Halloween High Heel Race. Starting time is 9:00 p.m, but get there early if you want to enjoy the show. Prior to the race, many of the participants (and those just in costume) parade along 17th Street. Time: 9:00 p.m., but be there early! Did You Visit Any Mid City Artists? Once again I managed to miss the Mid City Artists Open Studios this past weekend. 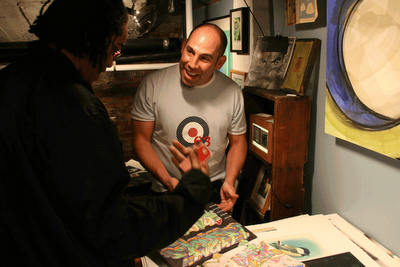 Luis made it, though, and has some nice pics of four local artists. Crepes Replacing Cupcakes as the New Trendy Food? I suppose this pretty much seals the deal: Crepes are replacing cupcakes as the new trendy thing to eat in Borderstan and surrounding environs. Two creperies are coming to 14th and S Streets NW. 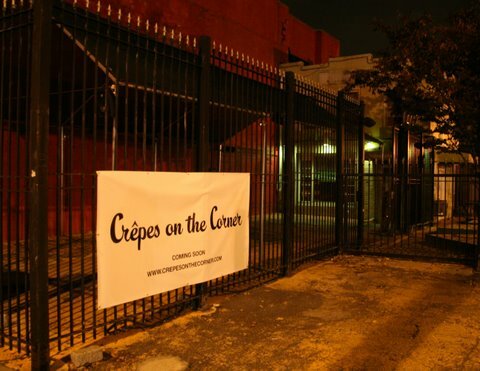 The one at the northeastern corner, Crepes on the Corner, will be a joint venture between Garden District owner Joe Carmack and Chef Vincent Bradbury. This is the site of the original Garden District location, which is now at the southwest corner of the intersection.